In Canada, here to be precise. I’m sat here in the Mountain Shadow Hostel at the end of my second day on the hill. My legs are aching and my face feels a little wind wipped but I’m smiling and with the prospect of another 67 days on the snow to go, who wouldn’t be? 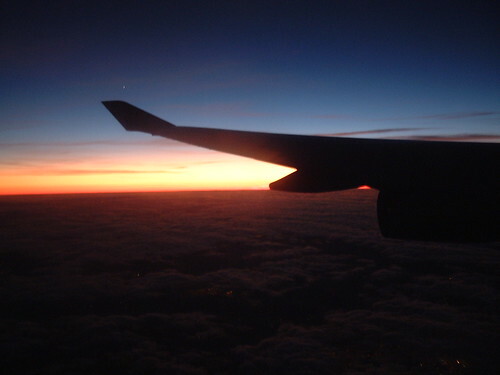 The flight from London was as to be expected, I was lucky enough to have nobody sat next to me so I was able to spread myself out a little, I did have a window seat and managed to capture the following photo as a result. Things took a little turn for the worst though when we got to Vancouver International and went through the Immigration services. With both Nathan and I going through and noting on our entrance forms that we were staying for 71 days the officials took a little more interest in us than they perhaps might have otherwise. Not what you need after a 9 hour flight. We spent a night in Vancouver at the Radisson (the last bit of luxury that we would see for a while). We took a taxi in to town bound for the China Town area to go and get some food. At 8 o’clock though on a Saturday night everything was closed, perhaps because it also seemed to be the area where all of the local deliquents hung out. We left. Quickly. 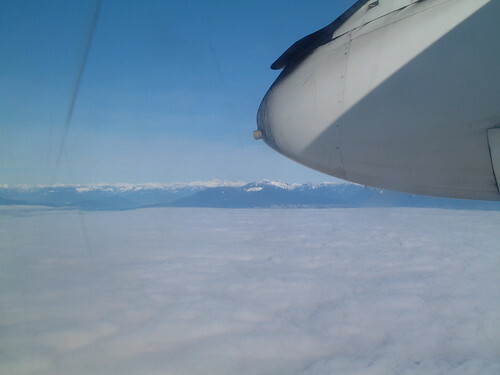 The next morning we were back to the airport for our transfer to Castlegar, or so we thought. As you can see in the photo below the cloud base was extremely low, as we approached our destination with the under carriage down we were told that they may be a chance that we wouldn’t be able to get in to the airport. For what seemed like an eternity we descended through the clouds. All of a sudden though the pitch of the engine increased and we were back up in to the clouds to be redirected to Kelowna. From there we hired a car and just about managed to get our kit in it. Anyway, the mundane story telling out of the way, the 2 days that we have spent on the hill have been fantastic, we had a few cms of snow yesterday and today was bluebird, we could do with a lot more but while we’re getting our legs back it doesn’t matter too much. There’s plenty of the hill still to be seen and that’s without having done any hiking. Don’t forget to check out the photos that I have taken so far, you can find them in the set that I have set up on Flickr here. This entry was posted in red mountain on 31 January, 2007 by danrough. Interesting article, I’d like to see us implement an agile approach here but can not get past point 1 at the moment. Maybe things will change eventually though. This entry was posted in agile, work on 24 January, 2007 by danrough. This entry was posted in del.icio.us on 12 January, 2007 by danrough.